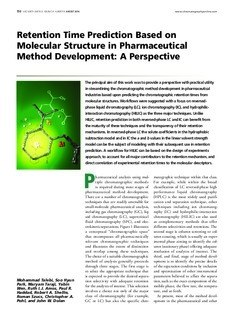 The principal aim of this work was to provide a perspective with practical utility in streamlining the chromatographic method development in pharmaceutical industries based upon predicting the chromatographic retention times from molecular structures. Workflows were suggested with a focus on reversedphase liquid chromatography (LC), ion chromatography (IC), and hydrophilicinteraction chromatography (HILIC) as the three major techniques. Unlike HILIC, retention prediction in both reversed-phase LC and IC can benefit from the maturity of these techniques and the transparency of their retention mechanisms. In reversed-phase LC the solute coefficients in the hydrophobic subtraction model and in IC the a and b values in the linear solvent strength model can be the subject of modeling with their subsequent use in retention prediction. A workflow for HILIC can be based on the design of experiments approach, to account for all major contributors to the retention mechanism, and direct correlation of experimental retention times to the molecular descriptors.